I know, I know, we just finished Halloween. And yes, it’s annoying that the stores already have Christmas stuff up! So, if you’re not ready yet, I apologize! But if you’re planning ahead, and going handmade for the holidays, you really do have to start thinking about it in November, so here we are. ENTER THE CONTEST — INFO HERE! Holiday Art Card Show – Artsy? Create a holiday card for the dabbled contest, and show off your work! Not Artsy? Download a cool holiday card from the cool artsy folks! – Crafters: If you have already have tutorials/blog posts on making cool holiday gifts/decor using recycled materials, email the link to holiday@dabbled.org. I’ll be posting links throughout the next two months. – Crafters: For entering the recycled craft contest, post pictures of your upcycled projects to flickr with the tag “dabbledholiday”, and add them to the dabbled flickr pool. If you blogged the project, you can link back to the blog post in the description. – Artists: Any cards you create must be CC licensed for personal use, so other Dabblers can download them. I’ll post more details on the Art Show later. 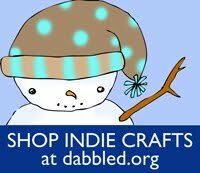 – Sellers: If you’re interested in participating in the Holiday Shopping link page, email me at holiday@dabbled.org with a link to your shop. If you’re offering any discounts for Dabbled readers, let me know that too. If we like it, we’ll need a small (like 200 pix wide) graphic to add to the shopping page. We’ll provide you a link button to the shopping page for your site as well, and you can help promote other indie crafters too!